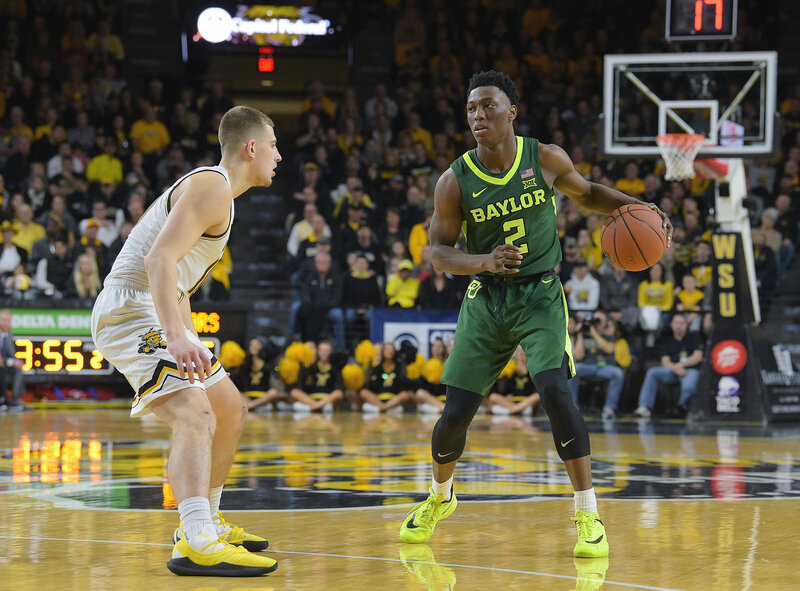 Preview: The Baylor Bears (#9, West Region) will face the Syracuse Orange (#8, West Region) and their vaunted 2-3 Zone in the first round of NCAA play. In general, #8 versus #9 matchups offer intrigue in NCAA first round play. They feature evenly matched teams who had similar seasons and the winner gets a shot at a top seed in the next round. The #8/#9 game in the West Region pits the Syracuse Orange versus the Baylor Bears. When facing Jim Boeheim and the Syracuse Orange you know what you are going to get. The Orange will come out in their 2-3 Zone; there are no surprises. The game offers a chance to preview how Scott Drew’s Bears will attack the trademark Syracuse 2-3 Zone. Baylor has used the inside ball screen versus 2-3 Zone throughout the season. The inside ball screen zone concept can distort the zone and force pieces of the zone to make tough decisions. 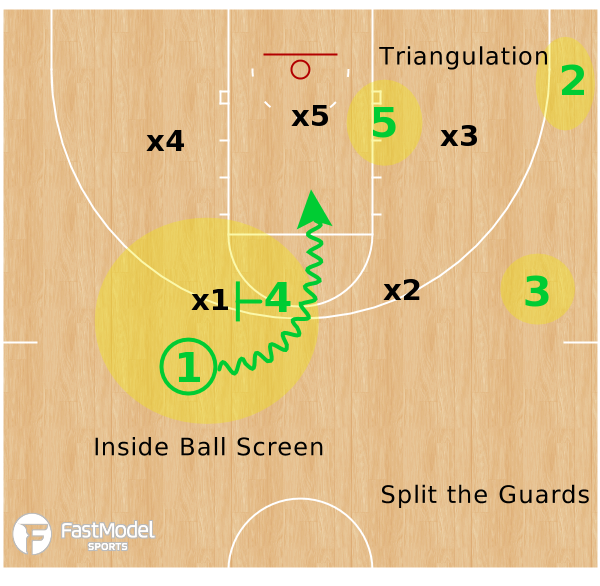 Baylor’s zone offense features two main concepts – the inside ball screen and “triangulation” of the Forward (X3 below) on the weak side. Ideally, the ball screen would allow for the ball handler to split the top guards for a paint touch. More often, the off-guard seals the gap between the top guards as X2 does in the diagram below. 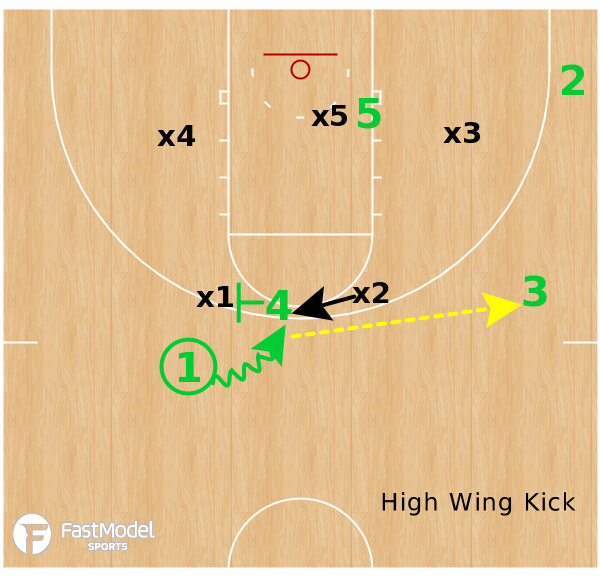 If Player 1 cannot split the top guards he/she should “play to the triangle.” Often that means a kickout to the high wing (Player 3 below). Players 3, 5 and 2 have the forward “triangulated” so long as Player 5 is able to duck in on the Center (X5). On the catch, Player 3 looks for shot first if the Forward (X3) stays flat. They may also “gap dribble” and attack the paint between X2 and X3. On the high wing kickout, Player 3 can look for Player 5 on the duck in (Frame 1 above). Player 5 must duck in hard; do not allow yourself to get fronted. Time the duck in with the flight of the pass to Player 3. 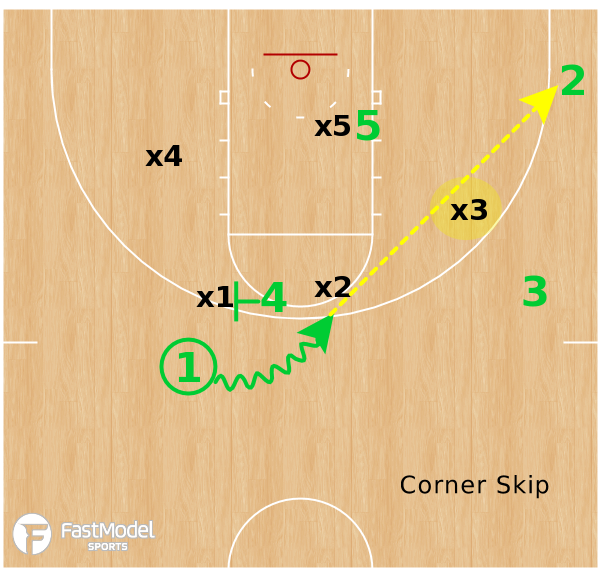 FastDraw Library: Add Baylor’s Inside Ball Screen Zone Concepts to your FastDraw Library! At times, the Forward plays high up the court or flies out at Player 3 to prevent the three-point attempt. In Frame 2 above, we see Player 3 transfer the advantage to Player 2 in the corner with a “one more” pass. The Forward may also move up the floor early to take away the high wing kick entirely. This leaves the defense vulnerable to the corner skip as diagrammed below. Player 2 may have a catch-and-shoot, baseline drive or a post entry to Player 5 on the duck in. It should be noted, that Baylor is also a zone defensive team. This matchup will give coaches a chance to pick up some zone offense tips from both teams. It stands to reason that a coach who plays zone most every minute of every game has picked up some ideas on effective ways to attack the zone along the way! The winner most likely advances to face Gonzaga, the #1 seed in the West Region. Baylor will get the first crack at unpacking the mysteries of the Syracuse zone. Look for the Drew and the Bears to use the inside ball screen to do so. Check out #ZoneOffenseTips on Twitter for more Zone Offense ideas! For help with practice planning and implementation of an zone offense attack featuring these offensive elements for finding, using and creating offensive advantages please contact us and/or join our community for basketball coaches!